West Bengal Criminal Investigation Department (CID) on Tuesday busted an interstate racket and seized 689 live and dead endangered Indian flapshelled turtles. 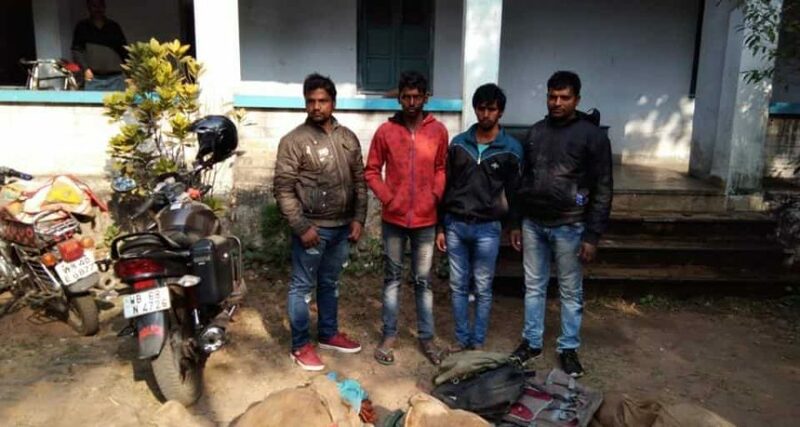 Acting on intelligence provided by the Wildlife Crime Control Bureau (WCCB), East Region, of the Union ministry of environment, forest and climate change, CID arrested four men, all residents of Sultanpur, Uttar Pradesh, when they disembarked from Doon Express at Durgapur station in West Burdwan district at 9 am. The men were smuggling the turtles in 22 jute sacks. The Indian flapshelled turtle is killed for its meat which is considered a delicacy in both Bengal and Bangladesh where these are smuggled. This was the biggest seizure of endangered turtles in Bengal in recent months and the second seizure in January. Tuesday’s raid established that smuggling of turtles from different parts of Uttar Pradesh is on the rise. “The arrested youths, Laxman Kumar, Raju, Rajkumar and Sushil Kumar, are aged between 20 and 30 years and residents of Pakri village in Sultanpur district,” said Agni Mitra, deputy director, WCCB (eastern region). The youths told CID officers that they wanted to sell the turtles at Bandel in Hooghly district. They were handed over to the state forest department. On January 4, officers from WCCB and state forest directorate seized 83 live Indian flapshelled turtles from Swarupnagar area of North 24 Parganas district. On January 11, the Uttar Pradesh Special Task Force (STF) claimed to have unearthed a nexus of wildlife smugglers after rescuing 327 endangered turtles and arrested four people from Etawah. The turtles were to be smuggled to Bangladesh through West Bengal, STF claimed. The turtles were trapped by local fishermen from canals and rivers in western Uttar Pradesh districts such as Etawah, Etah and Mainpuri. These were being taken to West Bengal in a luxury car when STF intercepted the gang. On November 16, 2018, UP STF team intercepted a major consignment, comprising 1,583 turtles, that was being smuggled to West Bengal in a truck.